Over the pasts two weekends nine volunteers from the North Stars Ski Touring Club and thirteen volunteers from Adventure Vacations, a Twin Cities based adventure travel company logged 332 hours cutting brush and down trees along the Banadad and hand cleared the Tall Pines Trail. 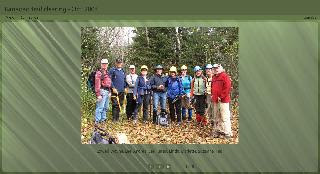 Prior to this volunteer effort, Boundary Country Trekking, staff had cleared and mowed the Lace Lake, and Seppala Trails outside the BWCA. Earlier this summer a group of eight youth and staff from the Minnesota Conservation Corp spent two days widening approximately 1.2 kilometers of an overgrown portion of the Banadad around Moose Kill Hill. As a result of these efforts, to date the Lace Lake, Tall Pines and Seppala Trails and the first 1.6 Kilometers of the Banadad now only needs snow to be opened for skiing. Along the 32 kilometer Banadad, most of which is within the BWCA, crews have cleared 21 kilometers. Minnehaha’s Academy’s High School Ski Team is scheduled to work on the trail in mid-November. They will round out this years volunteer maintenance effort. Then, as in past years, the remaining clearing of the Banadad will occure when snow arrives and the trail packing by snowmobile groomers can take place. These groomers, as they pack, will hand-cut the remaining brush in the remote interior sections of the trail, which volunteers could not reach. The mid-Gunflint Trail area around Poplar Lake and Little Ollie Lake received its first dusting of snow of the season last night. Not must on the ground but more is predicted. The current temperature at 8:00 am is 25 degrees and very windy. Nine North Stars arrived at host Ted and Barbara Young's Poplar Creek B & B on the evening of Thursday, October 16, ready to clear the BWCA’s Banadad Ski Trail. The group was put-up in the Little Ollie Lake Cabin and one of the rooms in the Poplar Creek Guesthouse B&B. Each day a huge farm-style breakfasts was prepared for us and we returned to mouth-watering dinners and a refrigerator stocked with beer. On Friday morning, we paddled across a very calm Poplar Lake. We left our canoes at one end of Mead portage and hiked a long trail, part of which was steep and rocky. The day's work consisted of nipping alders and overhanging pine branches as well as cutting down and removing larger trees. Two men took down a stony berm in the trail. Hiking to our canoes in the late afternoon, I noticed gold underfoot – gold leaves, gold cedar tips, gold pine needles – a welcome cushion for tired feet. The second day, we drove to a different area on the Banadad. Our group cleared from the western Banadad Trailhead in approximately four miles. A few of us ate our trail lunches sitting in the sun on a bridge crossing a rushing creek between East Dawkins and West Dawkins lakes. In the evening, several North Stars attended a meeting which saw the initial formation of the BWCA Banadad Trail Association, a non-profit dedicated to maintenance of the Banadad for future generations Ted agreed to continue to serve as Trail Maintenance and Grooming Coordinator. Our last day, we hiked to an area near Tall Pines yurt where we worked through the morning clearing the western side of the Tall Pine Yurt. Then we showered, packed, and ate lunch with in the B & B Guesthouse dining room. Ted thanked us for successfully clearing more than seven miles of the Banadad and he noted that North Stars have volunteered trail-clearing there for over 25 years, longer than any other group of volunteers. Barbara pointed out that only she has “volunteered” for Ted longer than the North Stars. Together, we all shared the highlights of our invigorating trail-clearing experience: beautiful fall weather; lovely small trees on the side of the trail -trees that will need nipping in future years; fascinating lichens, fungi, and rare sphagnum moss spores; a old two-holer outhouse along side the trail at the site of the "Old Logging Camp" which one North Star passionately wishes to be forever preserved; lively discussions touching on diverse topics, including politics; and absolutely fabulous meals, including a roast turkey dinner and an ethnic Nordic brunch. construction and/or improvements to a County Community Center, recreation area and public library. The steering committee has met twice and has decided to solicit public input before moving any further in the process. Three public meetings have been scheduled for the week of October 27. The meetings are being held at various times and locations throughout the county for the convenience of residents and business owners. Each meeting will have the same agenda; part one will be a presentation to the public regarding the background on the one percent sales tax, the proposed process and schedule. Part two will be an opportunity for the public to share their thoughts and ideas regarding the proposed projects. I certain have to agree that the Bittern is rarely seen. I can only recall seeing the bird one time before, many years ago- that time, in the fall, when working on the Banadad Ski Trail. Last night the eastern end of Poplar Lake on Little Ollie Lake received this fall’s first frost. The temperature at Poplar Creek Guesthouse B&B early this morning was 28 degrees. This is not to say that frost has not occurred previously in other areas of the Gunflint Trail. Two weeks ago inland from the south shore of Poplar Lake a temperature of 30 degrees was recorded. Meanwhile along the Gunflint the fall colors are now reaching their peak – the moose maples and pin-cherry trees are bright red and orange and the birch and aspen yellow. It quite beautiful!